Our Full Brake Inspection examines the condition of all of your brake components to keep you safe. Including Pads, Discs, Calipers & more.We'll provide you with a report on the condition of your brakes & outline any additional work required. You never know what's around the corner and when you might need to stop quickly and safely. For this reason, it's essential to have your braking system checked regularly by professionals. 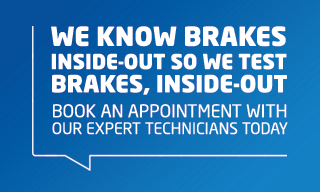 If you are unsure about the condition of your brakes, our friendly, expert technicians will check your braking system to identify any issues and help you stay safe on the road. Our brake specialists are fully trained and committed to maintaining your brakes in an expert and cost-effective manner. What's more is that all of our brake parts come with a 12 month guarantee (or 12,000 miles - whichever comes first). It's not always obvious that your car brake pads and discs need replacing but there are a few warning signs to look out for. If you hear any unusual noise such as your car brakes squealing or juddering when braking, or if you find your vehicle pulling to one side, you may need to have your vehicle braking system inspected. Simple wear and tear can also mean that you experience a reduction in brake performance. We offer convenient appointments that are flexible to your requirements. At ATS Euromaster, we offer two kinds of brake inspections: a FREE Primary Front Visual Inspection (which takes around 30 minutes to complete) and a Full Brake Inspection that takes approximately one hour. Our Full Brake Inspection examines the condition and wear on brake discs, pads and shoes, the condition of calipers/wheel cylinders, brake pipes (checks for leaks or corrosion), brake lights, handbrake cable and linkages, brake drums and fluids.